He is a poet of power and originality, a brilliant fantasist whose ideas are oddly compelling, a writer of fairy tales for adults. One reads many books without encountering anything so interesting. His poems display a ready wit and frequent flights of fancy. Imaginative, almost surreal fugues are characteristic of longer poems that appear in From Zero to One: an automatic record player begins to play records for its own enjoyment; the ghost of a dead wife continues to haunt the family home; office-workers take refuge in a secret room that seems to exist in another dimension; and a message from outer space proves to be either nonsense or higher sense. If Robert Zend were writing in English or French, he would be recognized as one of Canada's leading poets. But because he writes his witty, inventive, resourceful and extremely imaginative poems in his native language, he is known only to a handful of Canadians. I have translated his poems into English to remedy this sad situation. Among many exciting discoveries, Robert Zend was the big one for me. He has arrived wham-bam into the North American scene which he is both a part of and apart from. Though ego and energy, driving force and central insight into our culture like this could easily disperse the poetry, I suspect we'll be hearing more from Robert Zend. A wry geometer, Robert Zend takes measure of the chilly no-man's land of present-day Western urban life with penetration and pity, whimsy and wit. Like laser beans aimed at a holographic plate, his poems unscramble scene after scene, in which, I suspect, most of us figure--an un-heroic crowd, perhaps, but oddly "game." I am looking forward to see you again, Robert, in Toronto or in Budapest or in Moscow or on the Moon, and show our poems to each other: they have so much in common. From a poetry reading at Harbourfront in Toronto, hosted by Greg Gatemby in 1982. In the room in which I work, it often rains. Sometimes the sun shines, but usually it’s twilight. Bright in one corner, dark in another, the weather can’t seem to make up its mind. When I can’t take much more of it, I wander outdoors. The hills are gentle, the brooks are bubbling, the trees are whispering. Then I switch on the overhead light, turn up the heat, draw up a chair, sit down in front of my desk, and begin to work — until the clock tells me it’s time to quit. "Weather incongruously occupies the writer’s room. And this weather is personified as fickle: it 'can’t seem to make up its mind.' The writer seeks relief from the vagaries of the room’s elements and light by wandering outdoors through a soothing scene that is as clichéd — babbling brooks and rolling hills — as it is illusory, instantly morphing into an ordinary interior with overhead light, desk, and clock. In going outside and then inside, the writer has crossed no literal threshold, a clue that the divisions between indoors and outdoors, fickle and pleasant weather, and fantastical and quotidian are not literal either. "Instead, Zend renders a metapoetic image of the act of writing. The writer, disturbed by indecisive climate (perhaps a symptom of writer’s block), mentally steps outdoors into a calming, postcard-like scene, which seems just as unreal as the capricious indoors climate. The artificial banality of the landscape creates the degree of calm distraction that facilitates creative flow. But the results of that flow are not revealed, and the fashioned scenes of room and outdoors, of interior and exterior, themselves become the artifacts of writing, including the oddly mundane yet somehow apt ending: “until the clock tells me it’s time to quit.” Paradoxically, the poem’s subject (the writing of the poem) is both concealed and revealed in the act of writing. "Magritte’s Les Valeurs personelles (Personal Values) is possibly the work that inspired Zend’s 'Climate.' 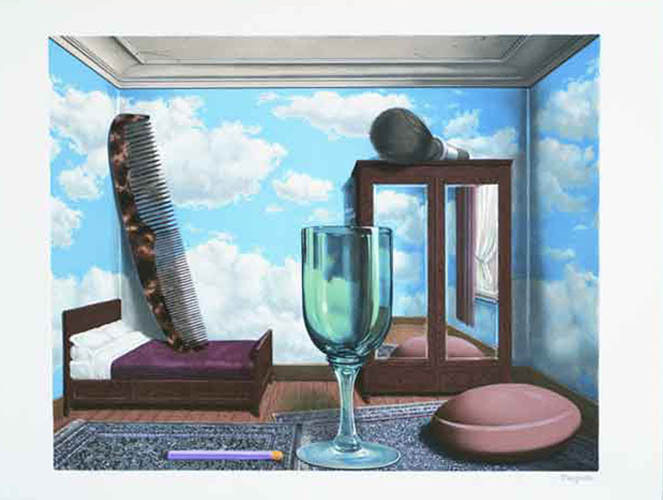 Like Zend’s poem, Magritte’s still life discombobulates the viewer’s sense of indoors and outdoors, and it subverts the normal utility of objects, as in the giant comb and wine glass. Magritte’s surrealism disturbs the normal context of objects (indoors becomes outdoors; small becomes gigantic), a feature of his work that informs Zend’s self-referential poem." Hardcover collection of poems by Robert Zend. 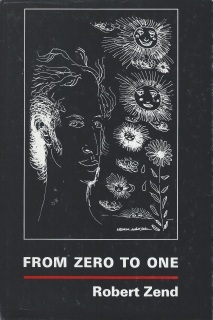 Translations by John R. Colombo and Robert Zend.